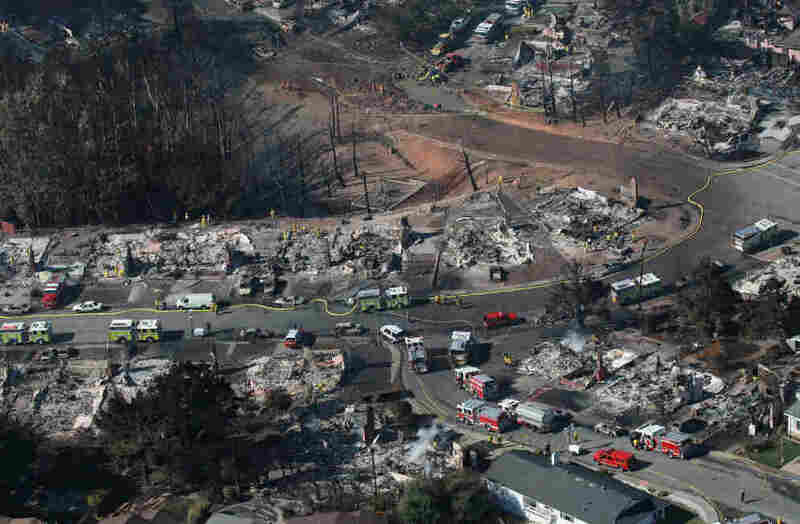 San Bruno, CA Disaster: 4 Dead, 52 Wounded, 38 Houses Gone : The Two-Way A gas explosion in San Bruno, Calif has left 4 dead, 52 wounded and 38 houses destroyed. 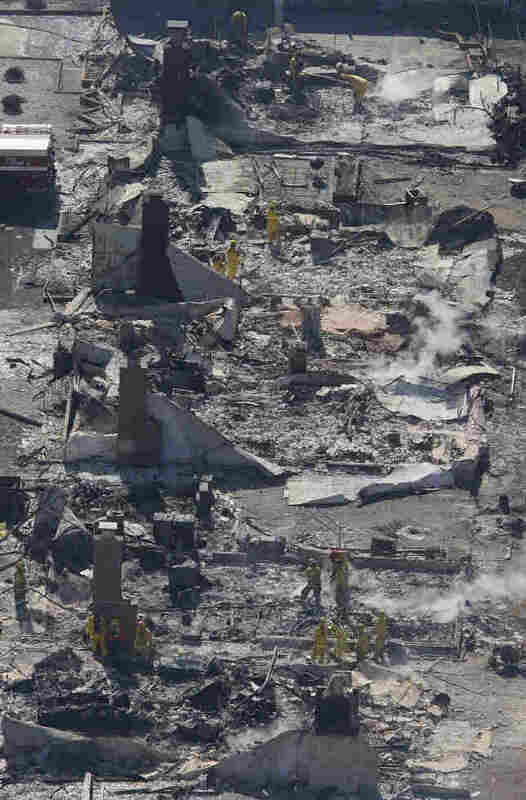 The natural gas explosion and fires in San Bruno, Calif. left a scene resembling the aftermath of World War II aerial bombing. The latest reports are that four people are confirmed dead, 52 are wounded and 38 houses are destroyed. Unfortunately, city officials expect the number of casualties to rise. What's known publicly is that a natural gas pipeline broke and exploded. What's not known, at least not publicly, is what caused the pipe to rupture. While the cause isn't known, there's some indication that the problem leading to the explosion may not have been sudden. Some residents told reporters they had smelled gas in the neighborhood in the days preceding the explosion and that PG&E trucks had been in the area. Johns said the utility had not confirmed that. The Chronicle story also has good material from area residents whose families were able to escape the inferno. The stories from the neighborhood will have a lot of people asking themselves if they would done as well in the same circumstances. Melanie Parkin, 34, lives on Concord Way at Fairmont, about a block northeast of where the pipeline ruptured. She was driving her 7-year-old daughter home from ballet and was about a half mile east of the neighborhood when she saw the fireball erupt. "My first thought was that was where my house is," she said. "I just floored it and drove home as fast as I could." When she pulled up in front of her house, the air was filled with hot ash and debris and the fire was roaring into the sky. "I told my daughter to wait in the car," she said. "By the time I got from my car to the door, I was drenched in sweat." Meanwhile, CNN has some stunningly sharp high definition video of some homes completely engulfed in flames.